As I approached Dishoom along the achingly cool Granary Square, with it's neon-lit choreographed fountains and past the trendy young-uns congregated on the canalside steps, my heart sank as I spied the 100m queue outside Dishoom. Luckily for me I was running late and my friends were already near the entrance! Still, we had a further 15 minutes or so to wait, during which we were served an amazing hot chai (I wasn't tempted by the sherry option), which was warming, comforting and satisfyingly spicy. Not my usual cuppa tea (geddit?) but just the job when waiting in the freezing cold. Dishoom has got to be worth the wait. Inside, we were given a seat near the entrance, to wait for our space at the bar. Had we been drinking the entire time we were kept waiting, we would have been on the floor by now! The staff were actually amazing, each person had a specific role and knew our names and even as we moved between waiting areas, kept up with our orders. The entrance was a hive of activity, with a central bar, not one we could order a drink at, I don't think, but it was all a-hub with busy bar-peeps making up cocktails. The whole area was a modernized industrial warehouse space, apparently formerly a railway transit shed, for interchange of goods between rail, road and canal. In Bombay it would have been know as a Godown. It wasn't long before we were led downstairs to the Permit Room. Finally a permit to get a drink. We were expecting to be waiting another half hour for a table, so we ordered a round of cocktails, firstly a flute of Bollybellini, a sparkling cocktail with raspberries, lychee and rose, with a hint of cardamom. 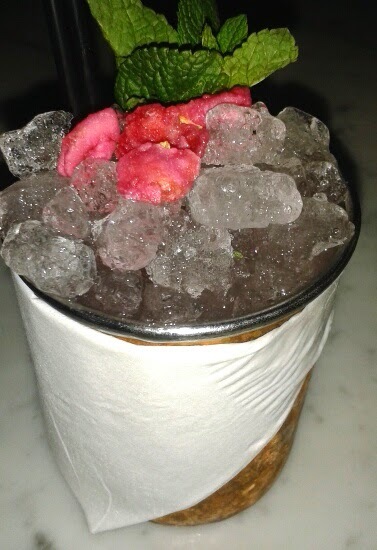 Next, an Edwina's Affair, pun-tastically, a threeway of gin, rose and cardamom, with fresh mint and candied rose petals. A taster of the Indian flavours to come. By then we were on the floor, with hunger, so we ordered a Far Far, a half crisp, half cracker, mistaking it for dried banana. It was delicious. Dipped in the accompanying mint sauce, onion salad, not a patch on the regular curry-house dips. Back up to ground floor level (high ceilings certainly don't cover it), walking on glass covering up mechanical stuff that looks so cool, but who knows what it was for, and following the trail of joss sticks, our table amongst the high-seated trendy crowd was what I would call cosy. It wasn't uncomfortable, but once seated, it felt unlikely I would be getting off that stool again for a while! Between four of us, we ordered four small plates. Again, your typical curry-house menu, it ain't. 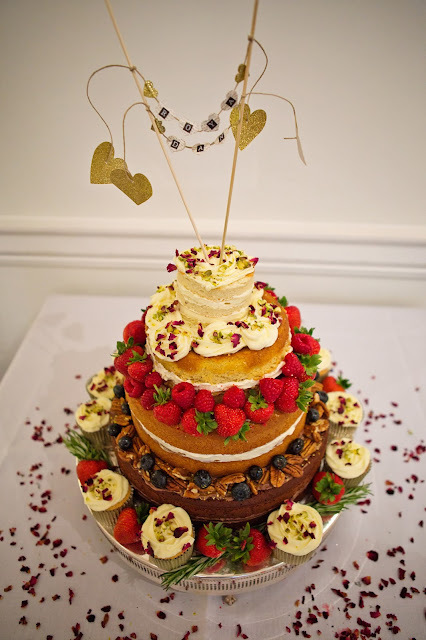 Mixed in with some familiar-sounding dishes were many tantalising British-with-a-twist options. Vegetable Samoans, Okra Fries, Dishoom Calamari, and the one in the box, Pau Bhaji, a mishmash of vegetables, made into an amazing sauce served with hot buttered Pau bun. No food is more Bombay, it says. I want to go and live there. 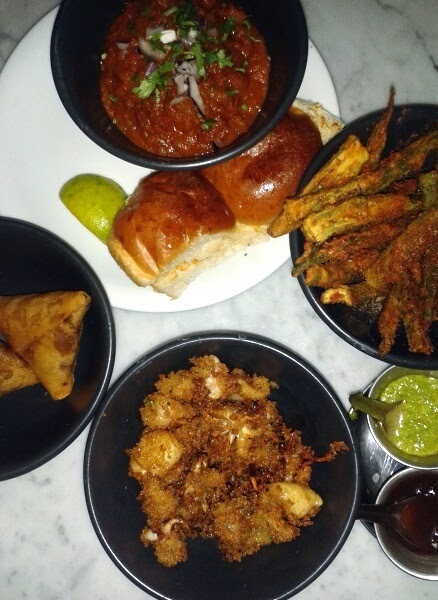 Veggie samosas, Pau bhaji, Dishoom calamari and okra fries. We were given ample time to finish our (non) starters, and then choose from one curry (well, two, if you count the veggie one) and the grills. I do love a pun, so the Ruby Chicken was a must (Cockney, innit), as well as a paneer version. 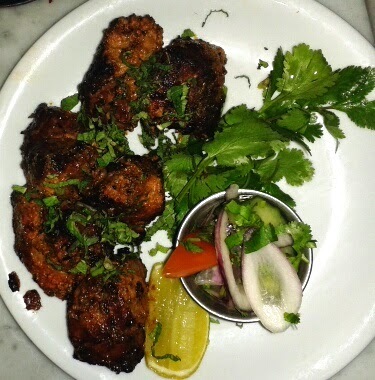 Along with this, we also chose the Lamb Boti Kebab, Mahi Tikka (any fish will do) and the signature Black House Daal. A rice, a nana, a bowl of greens and a roti, and we couldn't ask for more. We dipped and dived into each dish, enjoying the British Raj feel to the occasion, deviating completely from the Indian food I know and love. All the flavours were still there, subtle, none too spicy and the portion size was perfect. The only teensy criticism I would have is the lack of chilli, but that may be just me. Staff really knew what they were doing, and we never once felt intruded up, nor rushed or kept waiting. 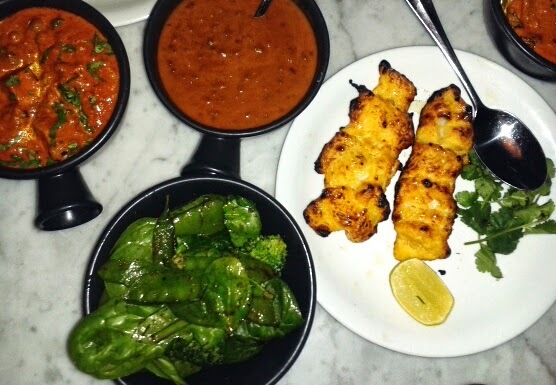 Ruby Paneer, Black Daal, a bowl of Greens and Mahi Tikka. Despite being totally full, we had a look at the dessert menu. Although the Guju Chocolate Mousse was tempting, we were instead intrigued by the Kala Khatta Gola Ice. Hilariously this was very true. It tasted like ice with spice. The first mouthful was bizarre. Two out of four stopped there. The second mouthful was strangely captivating and drew several more. But it wouldn't be something I'd choose again. But I'm glad I tried it. Overall, Dishoom really was amazing. Queuing aside, I would definitely go back, and I expect I would bring people here if I needed to impress them. And pretty good value for money, making the whole experience a real treat.